A good lip balm is a must have for all seasons. It not only keeps the lips protected from getting dry but also gives them a healthy feel and look. I have been using Nivea Fruity Shine Strawberry Lip Balm since the past two years and absolutely love it. Today I'll talk about the reasons why I love this product with you and also share the things that don't appeal to me. Lip Care from Nivea from the Fruity Shine range is a collection of tinted lip balms in fruit flavours. This lip balm is strawberry flavoured, and is designed for women who desire moisturised lips that are tinted with a pale, glossy pink. Tinted a reddish pink shade, it contains an SPF of 10. 4.8g come in one stick. It is designed for women. It can be used on all skin types. 1) The packing is leak proof and travel friendly. The roll out lip balm is easy to apply and can be carried around in our purses and bags. 2) It has a pleasant strawberry fragrance and a lovely red glossy effect which is not too subtle and neither too much. 3) It is non-sticky and gives the lips instant shiny and healthy look. 4) It contains fruit extracts and shimmering pigments that give the lips a party look too. So it can easily substitute a lipstick when going to parties. 5) It can even be used on top of mate lip colours to add sheen. 6) It moisturizes the lips and the effect last for several hours. 7) The balm contains an SPF of ten that protects lips from the ill effects of exposure to the sun’s harmful UVA and UVB rays. 8) Has an impressive shelf life of 30 months from the date of mfg. 10) Suited for all skin types. 11) Easily available across all chemist and cosmetic stores. 12) Nivea is branded name which again lends this product a trust factor in the market. 13) Value for money product. 1) Due to its glossy, shimmery look, it is suited only for girls. 2) The red tint in this product although better than majority others in the market has considerably lessened over the years which is unfortunate. 3) The stay-on effect of the product could be better. It wears off after sometime and re-application is required. Nivea Fruity Shine Strawberry Lip Balm is among the better lip balms in the market and with a MRP of 165 INR, it is a value for money product because it easily works both as a daily lip moisturizer and also a party lip balm. I love this product and recommend it to all the girls who want an effective and multipurpose lip balm. 4.5 out of 5 to it from me and I know I'll return to this again and again. 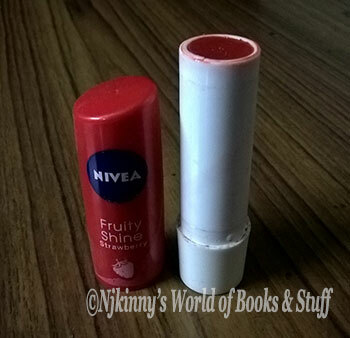 What do you think of Nivea Fruity Shine Strawberry Lip Balm? Have you used it before? Will you be using it? Do share your thoughts with me in the comments below. I love hearing from you.